Hyderabad airport is very clean, modern and has some reclining seats so I was able to chill out for a while. The flight from Hyderabad to Dubai took about 3.5 hours. It was relatively uneventful, but rather uncomfortable. I had an aisle seat, but the guy in the centre decided he wanted to sit with his elbows digging into my ribs and his leg pressed against mine. I wouldn’t mind so much if he was a big guy and couldn’t help it, but he was a skinny little thing, so taking all of his space and part of mine seemed unnecessary. As soon as we landed in Dubai airport, I grabbed some food and headed off for the boarding gate. Very soon we were on the plane and heading to Birmingham. I enquired about an upgrade, but it was going to cost $2,500 USD, so that wasn’t going to happen. I got to experience wifi on the plane for the first time. It’s been “available” on other flights, but I’ve never got it to work before. I got it working on the flight between Dubai and Birmingham. It was ultra-slow, but better than nothing and only $1. It made the 7 hour flight go a lot quicker. I arrived back in Birmingham safe and sound. After a quick taxi ride home I put my washing on, scrubbed the smell of aeroplane off me and went to bed! 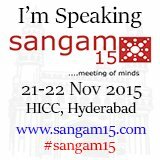 AIOUG Sangam15 : The Journey Home was first posted on November 24, 2015 at 2:40 pm.